Sakai Guides and DocumentationAssessments and Grading AssessmentsWhat are the Grading and Feedback options for an assessment? Grading and Feedback includes options such as whether to send grades to the Gradebook, the score that is recorded if a student has multiple submissions, and the types of feedback you make available to students. For more information on additional assessment settings, see How do I inspect and adjust the settings of an assessment? 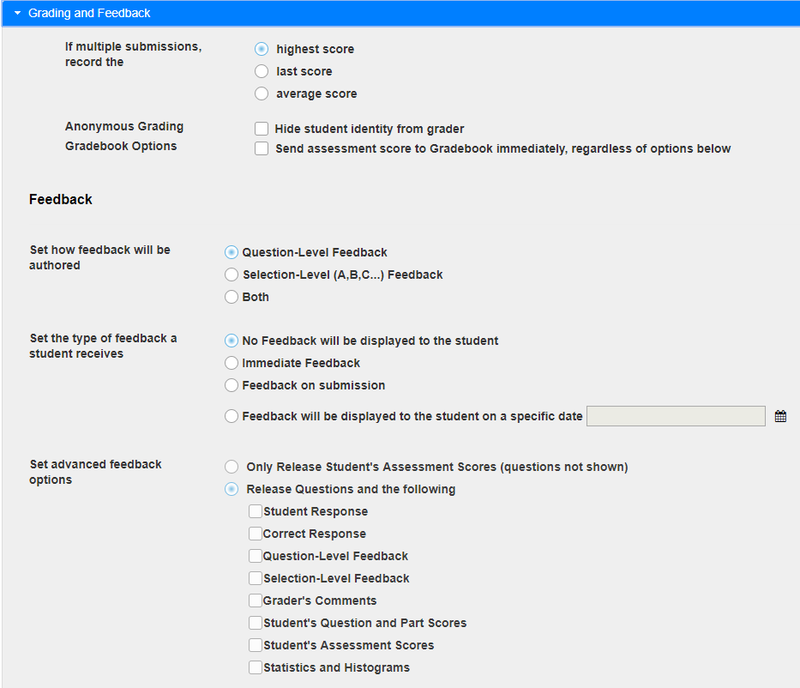 In the assessment Settings page, click Grading and Feedback. Recorded Score options include either the highest score or the last score, or an average score of all a student's submissions. The default setting is to record the highest score. If you allow multiple attempts, select the type of score that you want to be recorded for that assessment. Note: If you choose the option to Allow Retake for a student, and the assessment only allows 1 submission, the submission you'll see will depend on the Recorded Score setting. If your assessment includes manually graded questions, and you already graded it before allowing the student to retake it, the highest score will most likely be the first submission. You might need to change an assessment setting (either the Recorded Score or number of submissions allowed) after all the students have completed the assessment to view the retake results. The default setting here is that students' identities can be seen by graders. However, if you want to the submissions with submission IDs only, check the box next to Hide student identity from grader. Note: The Anonymous grading setting differs from the option to release the survey to Anonymous Users. You CAN change the Anonymous grading setting in the Grading and Feedback section after grading to see the students' names, but you CANNOT change the Assessment Released to Anonymous Users setting. If you want to send grades to the Gradebook, select the check box next to Send assessment score to Gradebook immediately, regardless of options below. Note: If you send grades to the Gradebook, scores will be sent immediately upon submission of the assessment. If you have any questions that are not automatically scored (e.g. short answer/essay, file upload), grades may appear to be artificially low until you enter scores for these questions. 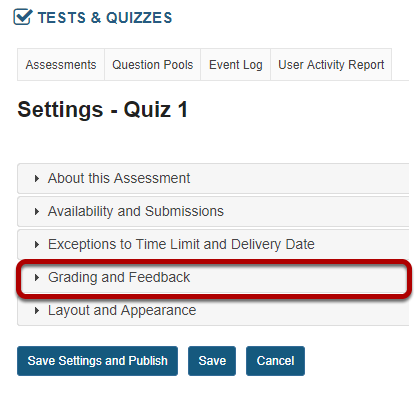 You can also wait until after all questions have been graded, then change the setting for this assessment in the Published Copies tab to send grades to the Gradebook. For Feedback Authoring, the default option is Question-Level Feedback. This allows the instructor to provide feedback for correct and/or incorrect answers for each question. You may also choose to display Selection-Level Feedback (i.e. feedback per answer choice), or Both. Note: You must select either Selection-Level Feedback or Both before authoring or editing a question to be able to enter selection-level feedback on the question editing page. If you have chosen either Question-Level Feedback or Both, you'll be able to type in Correct Answer or Incorrect Answer Feedback when authoring or editing the assessment. Correct Answer Feedback displays if the student selects the correct answer to the question. 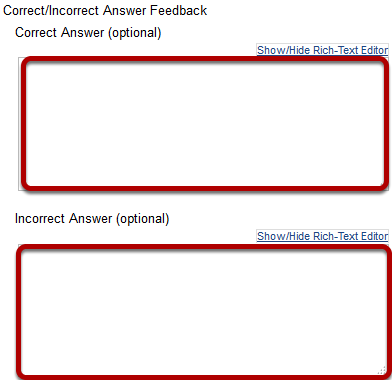 Incorrect Answer Feedback displays if the student selects an incorrect answer option. If you have chosen either Selection-Level Feedback or Both, you'll be able to type in a Feedback text box for each answer option when authoring or editing a question. Feedback on submission displays feedback to students as soon as they submit the assessment. Tip: If you are concerned about students sharing their exam results with one another, you should choose either No Feedback or Feedback on a specific date in the feedback type area above. Selecting a feedback date after the closing date for the assessment will prevent students from sharing feedback with other students who have not yet taken the test. If you select to give feedback and Release Questions and the following, but do NOT check any of the boxes for the types of feedback to release, students won't see any feedback. You can change the feedback settings after an assessment has been completed by going to Published Copies tab in Tests & Quizzes and selecting Settings from the drop-down menu for that assessment. Next: How do I adjust the layout and appearance of an assessment?